Gilia tricolor is an annual plant native to central California. Bees (and I) love the small, open-faced flowers. Gilia tricolor. Photo courtesy of Annie’s Annuals. I have read that they like moist soil, and I have read that they like dry soil. I’ve read they like hot conditions, and that they prefer cool summers. At $2.25 per seed pack, I figured I could experiment and see who’s correct. It’s entirely possible that they all are. The cultivar I am growing, ‘Felicitas,’ offers half-inch pale pinkish-purple blossoms brushed with darker red-violet tones in the throat of the blossom, and a sharp yellow color in the cup. The anthers hold faint blue pollen above the blossom, which makes for a charming, offbeat color contrast (should it be called Gilia quadricolor?). The plant self-sows where it is happy. This, like the Mina lobata profiled yesterday and several of the other plants I’ll showcase later this week, are open-pollinated annuals. That means that while they’ll live their life cycle in one year (growing, flowering, setting seed, and dying), their offspring will perform the same show the following year. Thus, although the plants themselves are not the same, the result in the garden is much like that of having perennials (those plants which do come back year after year). ‘Felicitas,’ seems to be on the smaller side, growing 12 inches tall and wide, whereas others grow slightly larger, 18-20 inches tall and perhaps 12-18 inches wide. The flowers apparently smell faintly of chocolate, and what they lack in size they make up for in abundance. The leaves are fine and needle-like. A member of the Phlox family (Polemoniaceae), they can be found in Yosemite National Park. 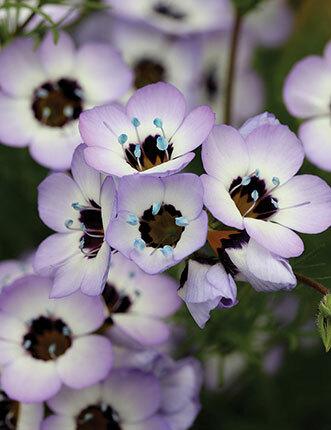 Gilia tricolor ‘Felicitas.’ Photo courtesy of Select Seeds. They are supposed to make fine cut flowers. I hope to grow these in the blue slope, a patch of west-facing land close to the radiant heat of the street. The plants that live out there need to be tough, and these seem to fit the qualifications. This entry was posted in 2014, Experiments and tagged annuals, gardening, gilia tricolor, nature, open pollinated, plants that come back year after year by missinghenrymitchell. Bookmark the permalink. This looks gorgeous. Hope it performs well for you. Those are some pretty flowers. I’ve had mixed luck with those western annuals, a great experiment though since they’re so subtle and beautiful. Godetia and clarkia are the ones I really wanted most… not as nice a blue as yours though! But the impomea did great, earlier blooming would have been nice, but it’s such a cool fall flowerer! This is really pretty! I’m growing cerinthe this year, which I’m totally new to and keep reading conflicting info. It will all be trial and error, I suppose. Those are beautiful flowers (I used to live in Central Cal and don’t remember ever seeing them) . How did they do in your garden?